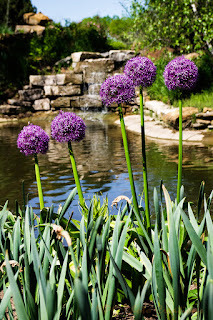 I was at the Overland Park Arboretum in Kansas a couple of weekends ago. It was the second time I had visited there. It's a beautiful place with lovely places to walk with many varied plants, flowers and trees. The large Allium flowers, part of the Onion Family, were in bloom and I captured them in front of one of the waterfall features.